The “USB Pushbutton” is a palm switch with a large dome. It connects to a workstation or PC via a USB cable. 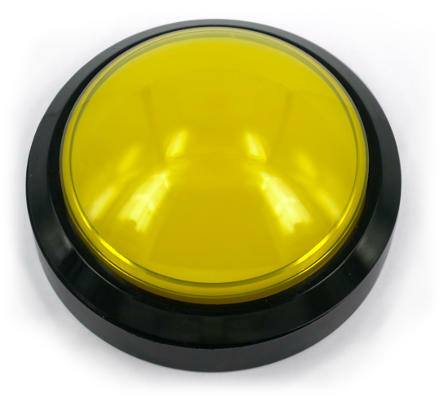 A press on the button sends a keystroke to the workstation. 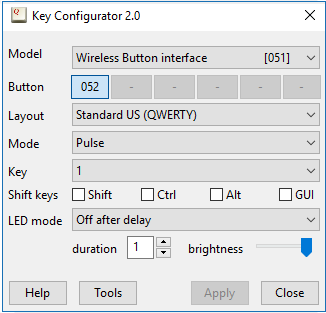 You can configure which keystroke that is. 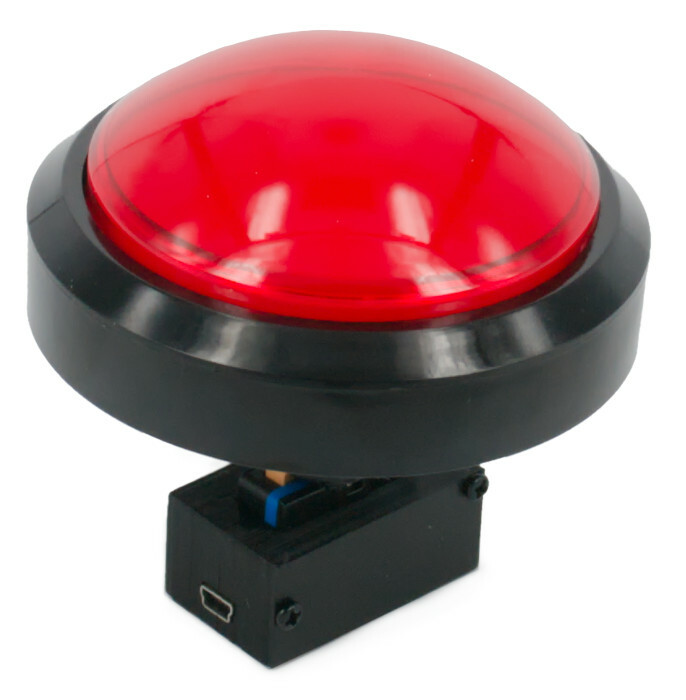 You can use the USB Pushbutton to perform any command on the workstation: launch a presentation, start a show, pause or resume playback, function as a “Quiz Buzzer”, or any other action. The dome is illuminated with a LED. The USB Pushbutton is recognized by the PC as a “keyboard” —with only a single key. Microsoft Windows (and other operating systems) have intrinsic support for these devices. The USB Pushbutton runs out of the box, no driver is needed. 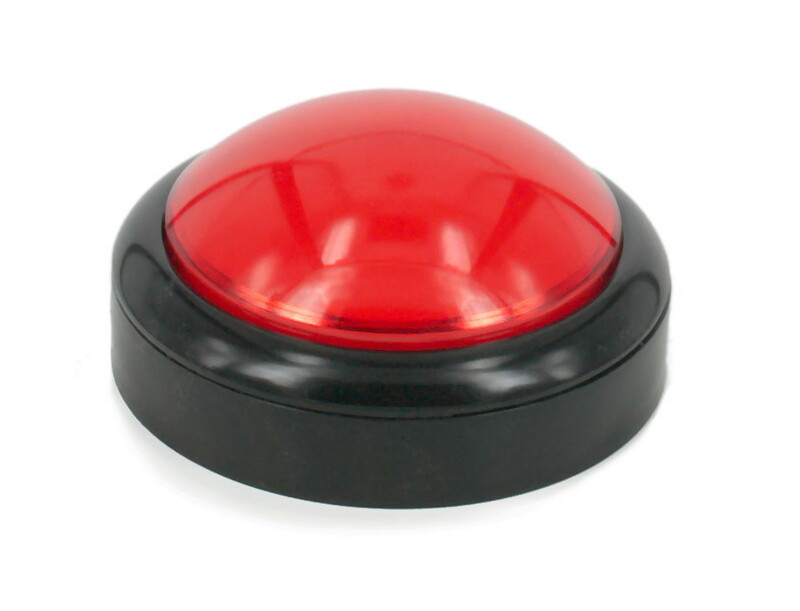 The button is fully compatible with “Game Show Presenter” and similar applications. The USB Pushbutton is a large illuminated hand or palm button, for indoor use. A 1 m cable is included, but the button is suitable for use with cable lengths up to 5 m. A “debounce” circuit avoids false triggering and an ESD protection filter on the USB input guarantees a reliable operation. The USB Pushbutton needs to be mounted on a panel (control panel, front panel). The switching circuit and the USB interface extend below the button. See the image below. 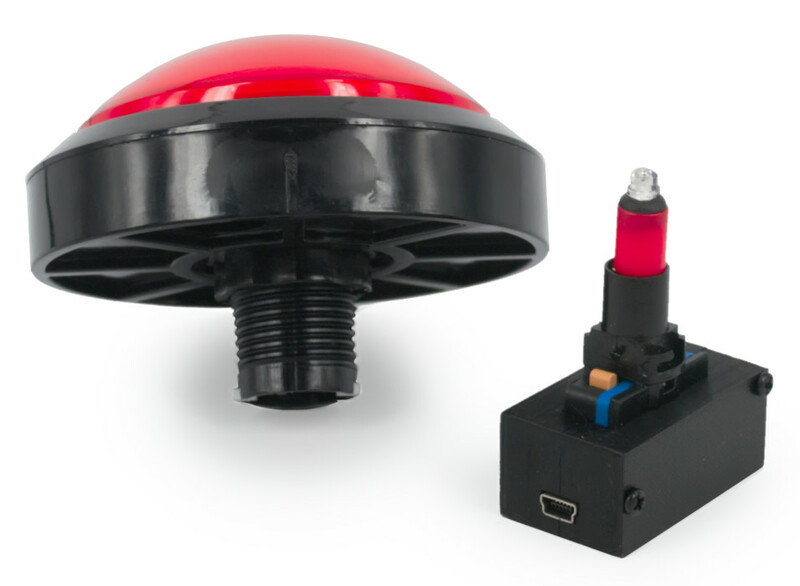 The box with the control interface at the bottom of the button is detachable from the button, for easy mounting. As mentioned above, the PC or workstation recognizes the USB Dome Button as a keyboard with one key. The key to transmit to the PC is configured via a free configuration utility, see the Downloads section. By default, the USB Dome Button transmits the key “1”. Multiple Dome Buttons may be attached to a PC at the same time, with each Dome Button configured to transmit a different key code (when configuring the Dome Buttons, each button should be connected to the PC one at a time). Dimensions Base diameter: 98 mm, dome diameter: 80 mm. Colour Base: black; dome: red. Actuation force 8 to 10 N.
Power supply Powered through the USB connection; 15 mA nominal non-illuminated, 35 mA nominal illuminated.